Planning & Time: Necessities to your design project. I’m sorry to say immediate gratification does not exist in remodeling; paint even takes time to dry! Hiring tradespeople, material selection, spatial planning and lead times all take longer than expected. So let’s talk tradespeople. It’s rare to find a contractor that can start immediately. Most are booked months in advance as homeowners are renovating rather than joining the rat race of buying a home. This attracts many “contractors” who aren’t qualified or skilled to do your job. So when you think you have found THE ONE, do your due diligence! Craftsmanship and reputation should drive your decision, not immediate availability and lowest bid. Your next hire? An Interior Designer. Every project, my clients are amazed how many decisions need to be made and in what order – like how the shower trim has to be specified before the sheetrock goes up because the valve and trim are proprietary. If you haven’t thought through your project, you will likely spend more time and money redoing things. Designers understand the expectations of the design process and help you manage the project…and contractors! Planning and ordering material can be tricky too. Design layouts, plumbing fixtures, hardware, tile, cabinets –you name it– all have different lead times and availability. Custom cabinets can be out 4-6 weeks. 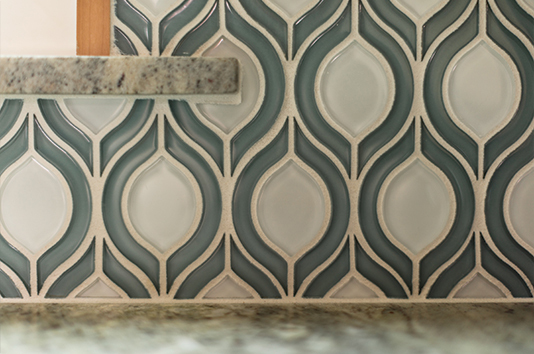 That mosaic tile you love? Takes 2 weeks because they are hand painted in Mexico. Oh, wait! You are ready to place that tile order only to hear it’s DISCONTINUED! You may think ordering material can wait, but lead times and availability will always stall your project if not planned in advance. This brings me to the budget. There is a budget and then there is a realistic budget. HGTV is what I refer to as “a budget” and then my clients’ faces when they get their first quote is what I call the “realistic budget”. Everything costs more than expected and the housing market is driving up material costs across the industry…including your remodel. Of course, there are ways to cut costs, just ask your designer! Side note cheap labor is NOT always a place to cut costs. Going over budget is a very real possibility and you want to be ready for it. Having at least 10% above your stated budget is always a good idea. You may not need it, but when that unforeseen issue arises, you got it covered! When you need that Victoria & Albert tub imported from Europe, you got it covered! Your eyes always fall in love with what your pocketbook dreads….your excess design funds have it covered. Wine guzzling, meltdowns, and dish-throwing should never get you through a remodel! Take the time to plan your design projects in advance. Find the right tradesmen for YOU. Buy the material when you first fall in love with it and be realistic with your budget. Most importantly, save the wine for the celebration when your home is finally what you want it to be! Join my e-mail list and get monthly updates and special offers on all things interior design! Are you ready for a space as unique as you are?